A recent post at Application Development Trends Magazine (“Analysts Keep Saying Big Data Is So Over“) forecasts the end of “Big Data” era in favor of the latest buzzword: “Systems of Insight.” In a very cool graphic (which I don’t have permission to reproduce, but you can see it here), the analyst firm Forrester positions Systems of Insight smack dab in the middle of Systems of Engagement (that touch people), Systems of Automation (that connect the physical world), and Systems of Record (that host processes). 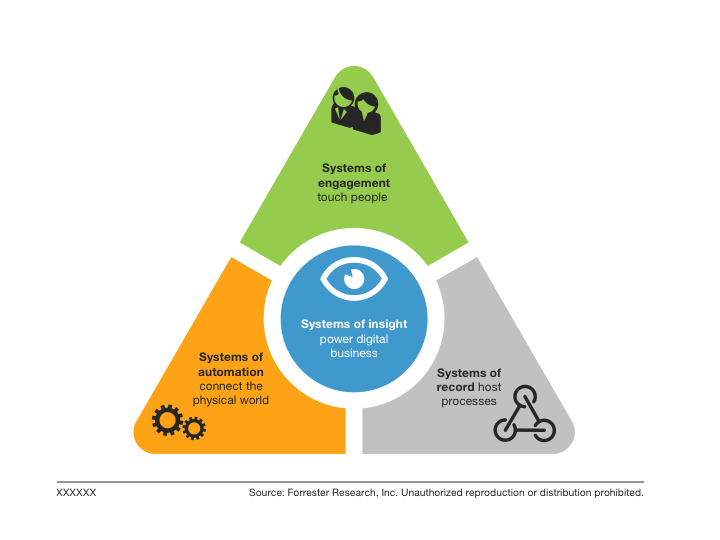 Systems of Insight, Forrester says, power digital business. While I’m naturally inclined to skepticism about the latest buzzword trend, “Systems of Insight” resonates with me. It matches what I see our customers doing with GainSeeker Suite, and the value they’re striving to get from working with us. Clearly GainSeeker Suite, as a Manufacturing Intelligence Platform, is aligned with this vision of a System of Insight. Whether we’re talking about turning field failures into supply chain leadership, or reducing product giveaway, or knowing where stuff is, or improving manufacturing performance, or any other application of real-time actionable intelligence, the ability to gain insight from data and make better, faster decisions is critical. For a quick an easy read describing this vision, check out my eBook, Tripping Over Data. You can download it free in PDF, iPad, or Kindle editions.